six-point five percent the following winter. 80 percent of TMRAO’s air service is revenue guaranteed. Prior to Scott’s tenure, payouts were as high as 80 percent of contract largest revenue guarantee risk cap amounts. In eight years at TMRAO, Scott reduced payouts to the 30-50 percent range and eliminated the organization’s sizeable debt. Overall seat capacity increased about nine-point five percent from 2005/06 to 2012/13 winters. Passenger arrivals increased over 18 percent during this same period. Weekly Airfare Tracking– Evaluated Telluride air fares in comparison to air fares in competing destinations. Frequent Tracking of Air Deals – Identify air price deals. Show a material price change to the regular historical prices or against competing destinations. Communicate these deals to the airfare club, tourism partners and other air service stakeholders. (air deals can see very short-term fluctuations vs. airfare tracking which considers longer term price trends). Value First Class Focus – Increase awareness of value first class airfares. Build land and air packages around the first class fares to increase paid first class purchases. Communicate detailed booking trends to airlines to encourage air sale initiatives. Increase air service option awareness through business card air schedules. Search and review community websites “getting here” pages for accuracy and completeness of information. Regularly attend meetings of key community organizations. Share updates and air service support initiatives with these organizations. Align community support of Montrose and Telluride airport air service. Load factor increased seven percentage points to 74.1 percent. – This is a level where sustaining or growing air service is possible in ski markets. Revenues and Revenue to Cost ratio improved. – Revenue guarantee payments reduced to below 50 percent of cap. – This was down from over 70 percent of cap in prior year. Incremental direct guest spend in community increased by $3 million +. Telluride Ski Resort skier visits increased by over 10 percent. TMRAO’s debt reduced by over $200,000. Air capacity increased by six-point five percent. Load Factor increased by an extra one percent. Revenue guarantee payouts fell by an extra 10 percent. Montrose Airport (MTJ) serves as a main airport point of access for visitors to the Telluride Ski Resort. Telluride Ski Resort is a world-class tourism destination. Montrose Airport also serves as the main airport for Montrose, Colorado residents traveling for business and pleasure. Prior to Scott Stewart’s engagement as Executive Director in June 2005, air service to Montrose saw little capacity growth. Load factors were below 68 percent. In fact, in some years before 2004, load factors were as low as 62 percent. Over 80 percent of the Montrose Airport winter service was revenue guaranteed. The average airline revenue guarantee payout after the winter seasons was in the 70-80 percent of risk cap amount. This high level of payout made increasing air service and capacity a challenge within the TMRAO budget. TMRAO was also over $2 million in debt due to very high payouts in earlier years. The Telluride Ski Resort and the Telluride and Montrose communities wanted to grow flight options. They wanted an increase in passengers to help drive an economy highly reliant on tourism. TMRAO needed to cut its debt. The 2005/06 winter season was Scott’s first winter at the helm of the air organization. At that time there was multi-daily service to Denver on United, and daily service to Dallas on American. Additionally they had daily service on Continental from Houston and Saturday-only service from Chicago on American. There was also Newark service on Continental and 4 days per week service from Los Angeles on Continental. Seat capacity totaled 114,293 inbound and outbound seats, down about six percent from the previous winter. The earlier winter load factor was just under 67 percent. Prior to Scott’s arrival, there was only modest coordination between local agencies. These agencies included the chambers of commerce, tourism association, Telluride and Montrose area governments and businesses. Scott, along with the TMRAO board of directors, set TMRAO’s goal for the 2005/06 winter season. Drive load factors above 70 percent and increase total flight revenues. This goal would better position the serving airlines for profitability. Driving higher revenues would cut revenue guarantee payouts in 2005/06. This would lower revenue guarantee caps (maximum payout levels) for air service in the 2006/07 winter season. It would also meet the load factor goal. Further, the organization would pay less for the 2005/06 winter revenue guarantees. Any savings would go towards the next season’s revenue guarantee program. This would enhance TMRAO’s ability to increase air service seat capacity and flight market options. These options could expand within the same level of annual budget and do so in a sustainable way. In order to meet this goal, Scott executed an air visitor capture program. We targeted this program at increasing community ownership and engagement in the Montrose Airport air service. Scott’s plan also focused on educating tourism organizations. The focus, to note the positives of using the Montrose Airport when making a trip to/from the region. Scott also engaged key air service stakeholders such as the Telluride Ski Resort and the Telluride Tourism Association. This engagement was on a regular basis to coordinate air service marketing and other support activities. The most effort for engagement was on inbound visitors. Visitors to the Telluride/Montrose region represented over 80 percent of the winter passengers. Increasing visitor usage would have a bigger impact on the goal of driving overall winter season load factors. Driving up flight revenues would drive up airline profitability. Community Flights improved collaboration between key stake holding agencies. They built a targeted email list of these agencies and communicating more often. In addition to email communication, Community Flights participated in tourism organizational meetings. These meetings included the Telluride Tourism Bureau, Telluride Lodging Association, Telluride and Montrose Realtor meetings, Rotary Club and others. While the majority of flyers are visitors, Scott also understood the high level of friends and family traveling. Scott also understood the power of the community as “Tourism Sales Agents”. Scott had TMRAO also focus efforts on local education and locals traveling out of the area. This focus led to increases in total flight sales and flight load factors. Scott also started tracking airfares to/from Montrose Airport and the top 10 markets serving Montrose. He identified these markets through Aviation DataMiner, an air data source. This tracking was weekly. Scott would also track the fares of other key competing Ski airport destinations from these same top 10 markets. He monitored Montrose Airport’s competitive price position against these markets. When Scott noticed a fare that gave Montrose a competitive advantage or a sale rate this would trigger a marketing action. Scott would craft an air sale/deal message and get this information out to community stakeholders. Community stakeholders were then encouraged to send or include this information in their messaging to their customers. They also would send to friends and family, past guests and current visitor prospects. We timed these efforts based on key tourism intelligence. We knew 80% of flying travelers book air at about the same time or earlier as other trip features. There were times Montrose air rates were not competitive with its ski air market competitive set. In these instances we contacted the airlines to ask for price adjustments. This above is one example of the many initiatives that drove incremental air sales. These initiatives increased load factors to over 74 percent on all flights into Montrose in the 2005/06 winter. This was over seven percentage points above what the load factor was in the winter of 2004/05. Community Flights further improved awareness of the air options at Montrose Airport through air service presentation recommendations. We reviewed all relevant travel associated websites in the region. Scott helped to enhance the content on many web sites through pre-made content. Scott designed the content to make it easier for potential visitors to find air information and book their air travel. We focused these information efforts on the Montrose Regional Airport. Scott also helped update website air information that had become out of date on these websites. Scott also produced business card sized air schedule cards that summarized the air service at the Montrose Airport. These schedule cards were available at the airport counters. They were also distributed to the various lodging properties and included in their guest pre-arrival mailings. As a result of these and other awareness efforts, passenger levels increased. Montrose carried four percent more passengers on six percent fewer seats during the winter of 2005/06. This increased load factor almost seven-point five percent. Montrose Airport load factor further increased during the 2006/07 season. It brought up the two-year increase in passengers to over 12.5 percent up from two years earlier. Scott had TMRAO also focus on first class and capturing more paying first class passengers. One aspect this strategy reduces the number of first class passengers who booked via frequent flyer mile upgrades. Frequent Flyer mile bookings bring little to no flight revenue (Depending on the airline). Frequent Flyer miles give little to no revenue credited against the flight revenue guarantee. Scott noticed that there were some good value first class fares when analyzing some of the airlines fare offerings. Some passengers would buy, these value first class fares thereby producing more revenue for the guarantee. Scott worked with the Telluride Ski Resort to create a “Value Premium” hotel and activity package. 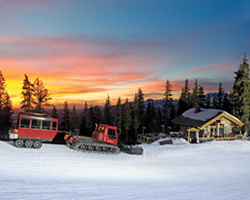 He worked with the ski resort to bundle this land package with value first class rates. This also helped capture more first class air travelers. The next step was to train the local fulfillment sources on how these value first class fares worked. We asked local fulfillment sources to promote these first class bundled packages once they understood the fares. In the first year of executing this program, first class seat sales increased by 10 percent. Sales of first class seats continued to grow in later years. Very often we sold coach seats to other passengers when some coach passengers moved up to first class. This increased not just first class load factors and flight revenues but overall load factors and flight revenues. The above chart demonstrates a $1.3 million dollar increase in overall flight revenues from 2004/05 to 2005/06. This was a 12 percent increase. It increased both the capture of spending passengers and selling more first class seats. On a macro level it increased total flight revenue and airline profitability. These focused community air service support actions were effective. They helped to drop the revenue guarantee payout at the end of the 2005/06 season. The Air Organization paid under 50 percent of the capped amount. This saved the community hundreds of thousands of dollars. We then reallocated these dollars to the next winter’s program. These funds helped drive a six-point five percent increase in capacity for 2006/07. We accomplished this capacity increase by adding NEW Delta service from both Atlanta and Salt Lake City. This highly focused air passenger capture program continued while Scott remained at TMRAO through the 2012/13 season. During this period, Scott managed the air program less than 30 percent cap risk payout in one season. Over the 8 years of Scott’s time in Telluride, the program averaged paying less than 50 percent of the cap. Only during the peak of the recession did TMRAO pay more than 70 percent of the cap. This occurred during only for one season (the 2009/10 season). Also during this period, TMRAO launched multiple new flight market services. These included: winter United Chicago non-stop service, low-cost carrier service with Allegiant Airlines from Oakland and Phoenix-Mesa airports. Overall seat capacity increased about nine-point five percent from 2005/06 to 2012/13 winters. Passenger arrivals increased over 18 percent during this same period. These results countered the results at most airports in the United States. Flight revenues increased over 51 percent. This was a big reason for Montrose Regional Airport increases in winter flight capacity. Additionally it helped in the acquiring of new market air service. These increases occurred without needing to increase available revenue guarantee funds. Compared to other SKI markets during this period, Montrose produced the best winter average load factor. Montrose also saw the highest percentage growth in capacity and passenger traffic. Most of the other ski markets saw capacity and passenger decreases during the eight season period ending in 2012/13. Skier days at Telluride Ski Resort also increased about 25 percent during this period. The community’s sales and lodging tax collections also saw large increases.